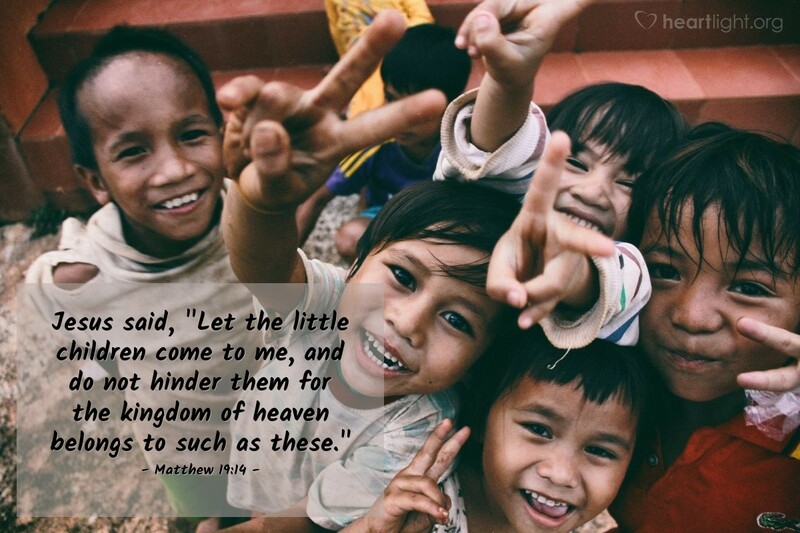 Jesus said, "Let the little children come to me, and do not hinder them for the kingdom of heaven belongs to such as these." Jesus' love for children in an age when they weren't highly regarded is a powerful reminder. It is a reminder of God's love for what the world often abuses or abandons. We are called to love the unloved, the forgotten, the abused and neglected. Why? Because that is what Israel was in Egypt and that is what Jesus was at Calvary and that is what we were without grace (Romans 5:6-11). How can we claim to know salvation and not share it with others who need that grace!? How can we claim to be Jesus' disciples and not show love for those the world forgets? Father, I want to be more of a parent like you — a holy and loving parent to my own children and a tender parent to the forgotten children of today. Help me not only to be aroused by the neglect and abuse children suffer in my world, but to be moved to act in ways that bless them. In the name of Jesus, the great lover of all children I pray. Amen.